Posted	 August 28, 2017 by	3HO-Legacy Organization & filed under Legacy Organizations, Meditation, Siri Singh Sahib Ji. This year (2017) we will practice the Master Key Meditation for the 5th Sutra, for 40 days beginning on the first day Summer Solstice. We will do the same meditation leading up to and during Winter Solstice. This chant is a master key to the Cosmos. It opens the way forward when you are stuck. Treat this mantra with reverence. It has the power to amplify your words, so after your chant it, keep yourself elevated. Vibrate the Cosmos and the Cosmos shall clear the path! This chant is a master key. After you chant this mantra, never utter a wrong or negative word. The entire Universe and its energy follows this mantra. There is nothing in the hand of God that you cannot take, and it won’t even bug Him. But there is a secret to it. The secret is in the reverse of it. Anything which goes this way must come back, too. That is the secret in it. It makes you totally intuitive. When this mantra becomes understood, there is nothing you don’t know. Do it anytime, anywhere for any reason. It opens up the Third Eye. It is open all the way. This is a trick, a gadget; that kind of master key or gadget which can open up everything. There is no such thing as “Om”; it is “Ong.” The conch must come out of the nose, it is a simple thing. Fire comes out of your nostrils, “Ong.” Both nostrils work. Ek Ong Kaar is chanted at the Navel Point. Always remember to chant it with the navel movement. On Ek Ong, the navel goes in; on Kaar, the navel goes out. Ek Ong Kaar:there is always a little jerk. Ek Ong Kaar is always at the navel. 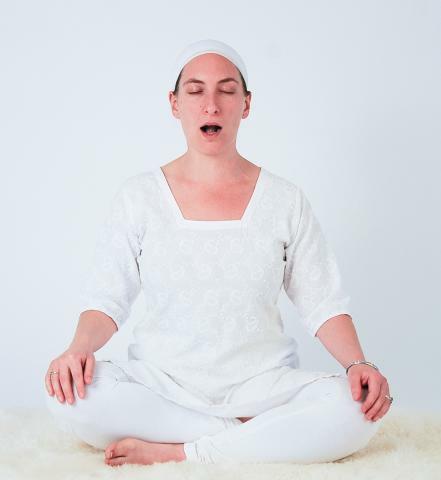 Hello, my given spiritual name by 3HO is Siri Mantra Kaur and I am learning this mantra, entering into it carefully given its power, while also tuning into my spiritual name. My sense is that Siri Mantra is not a common name. Is this true?